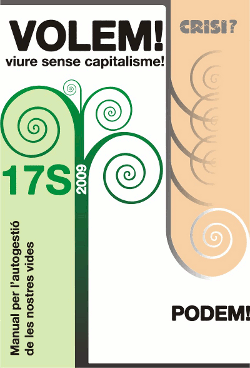 “We want to live without capitalism!” 17-M 2009. a manual for the self governance of our lives. This publication addresses each and every aspect of our daily lives: economy, housing, food, employment, transportation, energy, education…contributing new perspectives and solutions for each one of these themes. I have defined a master plan which aims at applying to the banks the same laws which govern the generation of money so as to give visibility to this mechanism, which is purposely kept hidden from people. To this end I have created many platforms for sharing the information and training people on the strategies of expropriation, creating money from nothing, just as banks do. 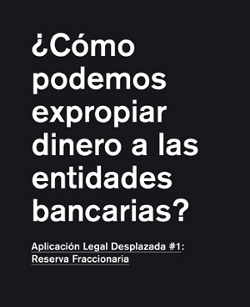 The first phase was the organizing of a pedagogical meeting under the title of “¿How can we expropriate money from the banks?” with contributions from Lucio Urtbia, Enric Duran and the economist Qmunty, in which we explained the mechanics of expropriation as well as the mechanics of money production by the banks. The second, has been the publication of a manual with the different expropriation strategies, legal advice and opinion articles. This manual has been distributed for free in many public places. Aimed at all those who want to take a step to make their life an example of their ideals and conviccions. Dirigido a todas aquellas personas que quieran dar pasos para hacer de su vida un ejemplo de su forma de pensar y sentir. Specifically to those who want to stop acting under the pression of economics and want to dedicate their time to those activities which have real meaning for them. En concreto a quiénes quieran dejar de actuar forzadas por la presión económica y quieran dedicar su tiempo a una actividad que realmente las haga realizarse. Also for those who want to see their money, as the fruit of their work, being used to support something they really believe I and not banks, politicians’ salaries, armaments, multinationals etc…amongst many bad uses we can think of. Economic disobedience includes all other forms of civil disobedience, which have as their prime objective our empowerment as free people, braking the chains of slavery which bind us to the capitalist system. -Stop paying debts to banks as a way of ceasing our connivance with them. – Economic disobedience as a way of ending our cooperation with the governmental institutions which work for the global capital, and as a mean of directly linking our money to the social projects deserving of our support. – Make ourselves insolvent I the long term as a tool to free ourselves from the economic power the system has over us, and to be able to participate with greater strength in social alternatives. -Get to know and spread the model of the Integrated Cooperatives and local currencies as a mean of generating daily and current alternatives. 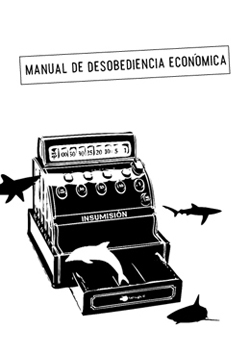 The tools by which we want to facilitate these possibilities would be, on the one hand, the manual for economic disobedience, which explains in every detail how to participate in the different actions which we propose. On the other, the various hubs where we can give assistance and support, to create a network of linked campaigns and actions like the tax insubordination or the no to mortgage debt.